After making it known that Windows Blue is just an internal codename for the upcoming refresh of Windows 8, the race is on to figure out what it will actually be called. According to ZDNet‘s sources, Microsoft looks to be naming its update “Windows 8.1” to make it easy to keep track of future iterations. ZDNet noticed that Roman L. (@AngelWZR on Twitter) posted a link to a screen shot of a recent build of Windows Blue showing the rumored final name of the software update to be Windows 8.1. This image initially appeared on a thread about Windows Blue on WinForum.eu. 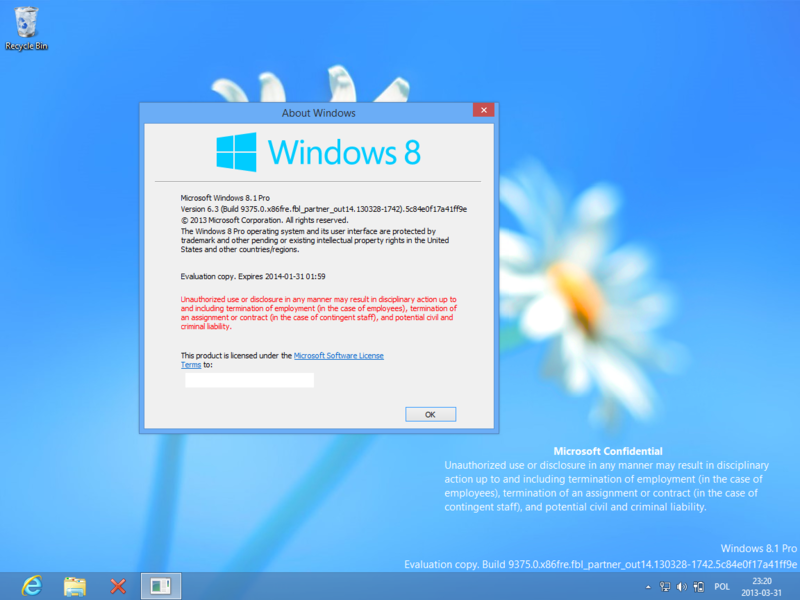 You can clearly see from the screenshot that it refers to Windows 8.1 Pro build version 9375, which must be the latest version because the leaked screenshots from last week listed build 9364. As we wrote last week in our roundup of what you can expect from Windows Blue, the leaked details we have about the update suggest it will include many tweaks for Windows 8 – including a more customizable home screen, and an updgrade to Internet Explorer 11 – but it won’t be such a departure from its predecessor that it will be called Windows 9. So why confuse consumers with all this talk about Blue? One way to wrap your brain around this potential naming system is to think back to Windows Phone Mango. Mango was basically a moniker for Windows Phone 7.5, an update to the Windows Phone 7 platform that included many changes but were not substantial enough to qualify as a brand new OS. Whatever the upcoming update to Windows 8 will be called, there is no longer any doubt that changes are heading to the operating system this August, with the attendees of Microsoft’s BUILD conference in late June getting the first look at the Windows 8 refresh.